Streaming .TV shows by Ustream Inside the ScottK Radio Show Studio and the Control Center for The WebMaster Internet Radio Network - LIVE! We now have a "WebChat Radio Widget" for use with Yahoo!Widgets! To download it, simply click on the image of the Widget and save it to your system. To use this wonderful little widget on your desktop, you first need to install the Yahoo!Widget's Engine from Yahoo!Widgets. 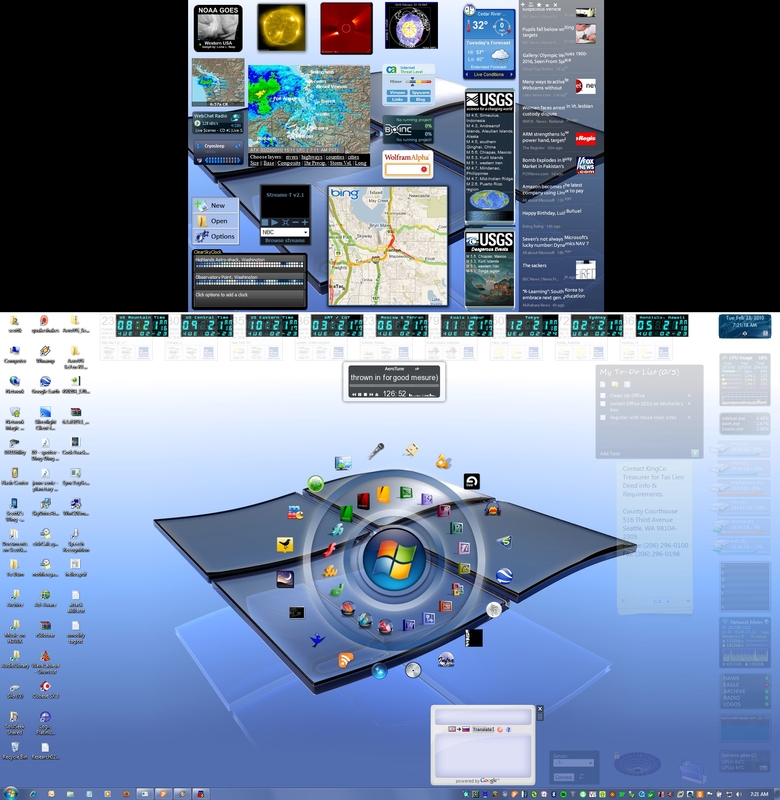 Once installed, you can use the WebChat Radio Widget to listen to WebChat Radio without having to use Winamp, Windows Media Player or any other Media Player, or even be on the www.webchat.org or www.webmaster.com web sites! Welcome to the semi-Official Webpage for...THE SCOTTK RADIO SHOW on WebChat Radio - Radio.WebChat.Org. Yes, it's true! Scott has begun DJing on The WebChat Radio Network. We have a very extensive playlist covering nearly 300 HOURS of music! Rock, Metal, Progressive, Alternative, Pop, Funk, Soul, R&B...music from the 40's & 50's to today's top hits. Scott now takes his sideline hobby (he used to actually DJ at dances back in the 80's and 90's) into the age of the Internet with "The ScottK Radio Show" on the WebChat Radio Network. The WebChat Radio Network is a SHOUTcast Streaming Audio service provided by the WebChat IRC Network (irc.webchat.org - http://www.webchat.org and it's owners, Webmaster, Inc ( http://www.webmaster.com ). WCRN IS NO MORE! !...well, actually - we just shortened the name a bit because of a variety of reasons that don't need to be discussed or intimated here. So, WCRN is now just "WebChat Radio". The URLs for WebChat Radio are still the same URLs as before, but we just simplified the name so there wouldn't be any confusion with anything resembling an actual Broadcast Radio station. We have several different ways for you to listen to WebChat Radio and The ScottK Radio Show - with the newest and, in my humble opinion, the easiest way to listen to WebChat Radio is our brand-spaking-new Yahoo!Widgets "WebChat Radio Widget"
At the top, you probably noticed a brand-new Player, courtesy of the fine folks at Webmaster / WebChat! You'll also find the WebChat Radio Player at the top of every WebChat.Org and Webmaster.Com page, including the Forums! The ScottK Radio Show runs continuously, 24x7, with a LIVE on-mic show from 4:00pm Pacific Time to 10:00pm ( 11:00pm to 6:00am GMT / UT ). Requests are taken from the start of the show up to 1 hour after the LIVE show ends. Click on the Picture Above to get a peek into what makes The ScottK Radio Show tick! The LIVE show is the more active and fun show, with ScottK's singular whit and charm. We take requests during the LIVE show. Our Motto: "If we have your request, we'll play it - if we don't, we'll go find it and play it anyway!" The Weekend Editions have sporadic on-mic time, and occasional Request hours announced on-air, with the Saturday Edition having more on-air time than the Sunday Editions. Our Maintenance Windows - when we do Studio Technical work - is usually done Saturday Mornings from 10:00AM to 12:00 Noon Pacific / 5:00PM to 7:00PM GMT. Please note: WebChat IRC Network outages may cause Streaming Audio outages. Phillip at Webmaster, Inc - for getting WebChat Radio back and running strong! "Danimal" (Dan) at Webmaster, Inc. for the WebChat Radio Flash Player - MAJOR KUDOS!. "crazee_kusanagi", "MoRPh" and "aGeNt_sM|tH" for arrainging our 24kps "side-stream" for all of our Asian listeners and also our dial-up users across the world. OUR LISTENERS for your support of The ScottK Radio Show and The WebChat Radio Network! !